I know this is random, but I’ve been studying Billy Graham lately and came across this video. I thought Billy did a good job keeping the conversation light, but dispensing spiritual truth at the same time. Woody Allen was funny too. Lou Dobbs says bring our troops home! Could this be the real reason Lou Dobbs was canned from CNN? Last week at the Innovative Evangelism Conference I got a chance to hear Dinesh D’Souza speak to a standing room only crowd. Many in the crowd were fellow evangelists, but there were a few seekers and skeptics present as well. Dinesh D’Souza is a renowned Christian apologist known for taking on the proponents of the New Atheism (people like Richard Dawkins and Christopher Hitchens). He’s also one of America’s most influential conservative thinkers. Dinesh’s arguments from science and philosophy were well thought out. He addressed post-modern arguments against Christian exclusivism with sensitivity, breezed through the theodicy problem (the problem of why a good God allows evil to happen), and built a case for Christian morality without resorting to bashing heads with Bible verses. He even managed—rightly in my view—to avoid the trap of defending irreducible complexity as an argument for intelligent design. All things considered, I thought that Dinesh did a good job presenting arguments for the reasonableness of Christian faith. So why did I leave disappointed? The weakest part of the presentation for me was when Dinesh defended Christianity against the charge that people in the name of Christ have committed some pretty horrific crimes against humanity, crimes like the Inquisition and the Crusades. Rather than renouncing the evil perpetrated in the name of Christ, Dinesh chose the standard apologetic response of stacking up the body count of crimes perpetrated in the name of Christ against crimes perpetrated in the name of atheism. The body count for the Inquisition? Four thousand. The body count for atheism? Millions. Christianity wins. Not to say that there isn’t some merit to D’Souza’s argument mind you. It’s true that when you consider Lenin, Mao, Stalin, and Pol Pot; the body count for atheism in the 20th century alone far surpasses the body count for crimes committed in the name of Christ. D’Souza also rightly pointed out that atheism—more specifically the Marxist brand—was crucial to the philosophies of these barbaric dictators as opposed to the supposedly religious conflicts that are often really about land and resource distributions (like the Catholic/Protestant conflict in Northern Ireland and the Israeli/Palestinian conflict). Leaving aside the potential counter-argument that Christianity has it’s share of religiously motivated wars as well (think—the 30 years war, the Great Schism) it’s at this point that a thinking skeptic could say, “Yes, it’s true that without religion there would still be wars over land, ethnicity and political philosophies, but the thing particularly dangerous about religion is that religion provides a transcendent source that allows people to dehumanize others with the approval of their conscience”—and the skeptic would be right. This is why Jesus—not historic Christianity—should be the object of our apologetics. Throughout His earthly ministry, Jesus categorically rejected violence, nationalism, and the fusion of faith with earthly power, as did His followers for roughly the first 300 years of Church history. At around 325 A.D. the church and state developed a very cozy relationship under Constantine, producing what author David Bercot from Scroll Publishing likes to call the “Constantinian Hybrid.” It seems to me that in his counter-arguments to the New Atheists moral objections to religious faith, what Dinesh defended wasn’t so much Christianity, but Constantinian Christianity—the kind of Christianity that’s very comfortable fusing faith with earthly power. Lest I be misunderstood, I’m not suggesting that Dinesh D’Souza approved of the Crusades and the Inquisition in his presentation. It’s just that something seems awry to me when a leading Christian intellectual has to tell his fellow believers that we should all be patting ourselves on the back because our predecessors haven’t tortured and killed as many people as the predecessors of other faiths and belief systems. Maybe I’m missing something, but I’m not sure why a non-Christian should be impressed with that. It seems to me that once we accept Constantinian Christianity as normative, we’ve seriously lowered the bar. As a Christian evangelist, D’Souza’s presentation forced me to ask myself perhaps the toughest of all questions. To what degree does the Christianity that I’m preaching look like Jesus? On November 10-13th, over 350 national and international evangelists gathered in Portland Oregon to attend the Innovative Evangelism Conference. The conference was organized by the Next Generation Alliance, a ministry of the Luis Palau Association. 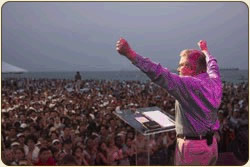 Luis Palau is famous for attracting hundreds of thousands of people in cities across America and around the world to his “festival events”, pioneering what has now become known as “festival evangelism.” Although Luis Palau is about 15 years his junior, many people consider Palau to be the heir to Billy Graham’s legacy. The first night of the event brought about 1,000 people from the community for a free Matt Redman concert. Although Redman is well known around the world for his contemporary worship songs such as “Blessed Be Your Name” and “The Heart of Worship”, few people know that Redman was converted at a Luis Palau event in London when he was 10 years old. As a missionary/evangelist attending the event, Redman’s presence, followed by an exhortation from Luis Palau, served as an inspiring example that—contrary to popular belief—mass evangelism does work. The following evening, after a full day of workshops exploring topics like “Guerilla Evangelism”, “How to Shake a City”, and “How to Effectively use Extreme Sports for Outreach”, Dinesh D’Souza was the headline speaker. The renowned apologist was named one of America’s most influential conservative thinkers by The New York Times Magazine and is best known for his books What’s So Great About Christianity and Letters to a Young Conservative. 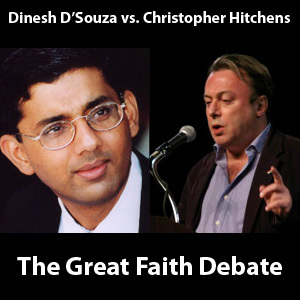 D’Souza spoke to a crowd of well over a thousand people (many of them seekers) about how to defend the Christian faith from the “New Atheists” (people like Sam Harris, Christopher Hitchens, and Richard Dawkins). One of the surprises of the night was that Dinesh D’Souza didn’t follow the classic defend intelligent design/bash Darwinism paradigm preferred by many Christian apologists. Rather, D’Souza chose to uphold Darwinism as a natural mechanism explaining the diversity of life (and also upholding the 13-15 billion year age of the universe accepted by most scientists) while rejecting the usage of Darwinism as a metaphysical argument for atheism. D’Souza instead chose to appeal to arguments based on modern scientific discoveries such as “multiple dimensions”, “dark matter”, and the fact that time and space are part of the material universe, (created during the Big Bang) thus making it possible to believe in an eternal being that lives outside of time and space—something that would have been considered nonsense by mainstream science a hundred years ago. On the final day, the headline speaker was Miles McPherson, a former NFL star turned pastor/evangelist. McPherson wowed the audience with humorous examples about how some of his smaller teammates used to “talk trash” to guys twice their size, even after being knocked down. McPherson’s point was that while the Devil tries to intimidate evangelists by knocking them down, evangelists should always be on the offensive—and never quit! A striking feature of McPherson’s presentation was his emphasis on the elite nature of the evangelist’s calling and how those of us attending the conference were called to a difficult task that few are willing and able to do. On a personal note, one of the things that struck me about the conference was the noticeable lack of ego on the part of the Palau staff and the conference attendees. Evangelists often get a bad rap in American culture, especially successful evangelists. Many people assume that evangelists that draw large crowds are bound to have large heads as well. What I saw at the conference was over 350 evangelists, many of whom preach to tens of thousands of people a year, ready and willing to help and serve one another, regardless of the size of their ministries. What other conference can an evangelist go to where you can have lunch with someone like Andrew Palau (who preaches to hundreds of thousands of people a year) and rub shoulders with someone like Scott Lenning (who was one of Billy Graham’s North American Crusade directors for 20 years) and feel like you’re a part of the team? Without question, the spirit of camaraderie is due to the staff of Luis Palau Association and the Next Generation Alliance and their vision to train and to mentor the next generation of evangelists. Thank you Luis Palau and NGA for a wonderful event! two Christians, two perspectives, one blog=brilliant!! I’d like to introduce you to a new blog. Kim and Cara are both Christians. One is politically conservative and the other is politically liberal. Get this. They both love the Lord–and each other! Imagine that! 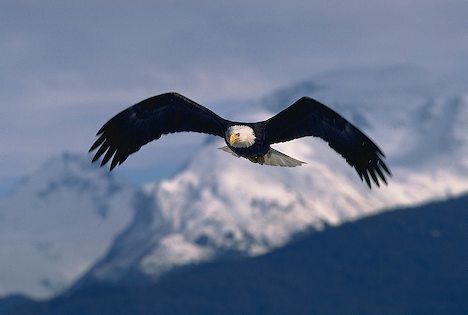 They’ve started a blog called Lifted on Eagle’s Wings to symbolize the two major political ideologies in America, conservativism and liberalism, as two wings for the same bird. They want to bring some civility to the two sides and break down barriers of misunderstanding. If you’ve read my book, then you probably know what I think of something like this. I’m back from Senegal, and I have to say, I’m really digging the fall weather! Senegal was miserably hot, which made for an exhausting trip. The good news is that the back- to -back workshops went very well. Our first workshop was in the town of Ziguinshor. We had to start the workshop two days late because of the recent unrest in the area. We were warned repeatedly not to take the taxi because rebels and bandits had been known to rob (and sometimes kill) people on the way to Ziguinshor. Because of that, we decided to take the boat, but unfortunately, the boat was already booked, which is why we had to catch the next one, which didn’t leave until Tuesday evening. Eventually we got there (after a night of sleeping out under the stars) and we were able to make up for the lost time. On one of the days, a Muslim came in to the church and participated in the stories and discussions for an entire day! Although the workshop was for Christian workers, the Muslim man was one of the most enthusiastic participants, which turned out to be a great object lesson because one of the premises of the workshop is that telling Bible stories and asking questions is a non-threatening way to share the gospel. The workshop in Dakar brought a very select group of pastors and missionaries. Many of the pastors came from the rural areas. We were told that most of them lived off of $20 a month. Imagine that! The response to the teaching was very positive. One particular pastor told me that he planned to teach the story concept to his evangelism team to enhance their ongoing ministry in the villages. There were also some Western missionaries, including a team of Brazilians, in attendance. Every one of them told us that the teaching we were offering would enhance their ministry. Next week I’ll be going to Portland Oregon to present a workshop session on evangelizing oral learners at the Innovative Evangelism Conference, organized by the Next Generation Alliance, a sub-ministry of the Luis Palau Evangelistic Association. I am very excited—and honored—to be able to participate this year as a workshop presenter. Please pray that I’ll do my job effectively and that more doors will open for this ministry as a result of the presentation. Billy Graham and theological humility, will the next generation follow in his footsteps? Every three years, young evangelists from around the world gather in Portland Oregon to attend a conference put on by the Next Generation Alliance, an organization dedicated to mentoring the next generation of global gospel preachers. While I’m looking forward to the Innovative Evangelism Conference next week, I think a serious reflection on the man that most of us attending the conference draw the bulk of our inspiration from—Billy Graham—is in order. The typical Billy Graham narrative goes something like this. Billy started his ministry as a self-assured fundamentalist. In the early days of his ministry, preaching the gospel went hand in hand with defeating communism. Eventually Graham’s championing of the Vietnam War and his close association with Richard Nixon caught up with him and he got burned, resulting in a crisis of faith that produced a much gentler and wiser Billy Graham. As familiar as this story is, I think it’s a mistake to reduce Graham’s metamorphosis to pre-Nixon and post-Nixon—as if the only thing Graham learned in his older age was that it’s a mistake to politicize the gospel. Such an oversimplification of Graham’s life and ministry overlooks a key aspect of Billy Graham’s legacy that’s become somewhat of an elephant in the room. Whether we like it or not, Billy Graham’s life and ministry represents a middle ground between fundamentalism and theological liberalism. Take for example two issues that have become litmus tests for orthodoxy among Biblical fundamentalists—evolution and the fate of the unevangelized on judgment day. On the subject of evolution, Billy Graham has consistently maintained throughout his ministry that Christianity and evolution are compatible. While it may be fashionable for evangelical leaders today to speak of intelligent design over and against young earth creationism, Billy Graham goes even further by insisting that the Bible is not a science book, and shouldn’t be read as such. On this matter Graham is further to the left than the average evangelical, although his Biblical hermeneutic on the rest of the Scriptures remain a far cry from theological liberalism (For example: Graham may see the seven days of Genesis as figurative, but he maintains that Jonah was actually swallowed by a whale). At first glance it may seem like the older Billy Graham has single-handedly undermined his entire life’s ministry as an evangelist. Some have even attributed his comments—and other comments like these—to senility. Still others have written him off as a heretic. Again, the reality is more complex. Billy Graham has never wavered in his belief that Christ’s death and resurrection is the only means by which a person can be saved, and neither does he apologize for his commitment to preach the gospel for the conversion of sinners to Christ. 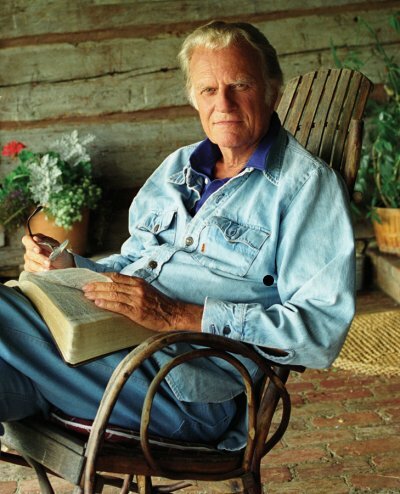 What the older Billy Graham has learned, however, is that a person can be resolute in their commitment to the gospel and be theologically humble at the same time. Ironically, it’s Billy’s example of theological humility that may free the next generation to ask some hard questions about the classic evangelical gospel that he popularized. For example, does the classic evangelical gospel, complete with an altar call and the standard sinner’s prayer, take seriously enough the teachings of Jesus against accumulating wealth and earthly possessions? To what extent should non-violence and identification with the poor be proclaimed as part of the gospel of the Kingdom? Has the sinner’s prayer been overemphasized at the expense of baptism as the initiation into the Body of Christ? These are difficult questions with no easy answers, which is why the next generation of evangelists could use a dose of Billy Graham’s theological humility. Billy Graham has served his generation faithfully, but even Billy knows that he doesn’t have a corner on truth—and neither will the next generation that follows in his footsteps. Billy Graham has led the way, but now it’s up to us, the next generation, to carry the mantle and hear what the Spirit is saying to our world today. I think Billy would agree.